Is it more satisfying to be an ER nurse or doctor? Q: Hi, my name is Melissa, and I have always dreamed of working in the emergency room. I have read tons of books by emergency room doctors including yours. I just wanted to ask what different roles do the emergency room nurses and physicians play? At first I was thinking about being a nurse but then I thought I might not be interacting enough with patients. I love people. Would I be satisfied being just a nurse? What would I get out of it differently than being a physician? A: ER doctors and nurses have very different roles. Nurses do the initial assessment (triage) when patients arrive in the ER, asking pertinent but limited questions to determine the nature of the injury or illness and when the person needs to be seen (now, or can it wait until more serious patients are first seen?). The ER doc then sees the patient, asks detailed questions, performs an exam, orders tests, etc. The nurses carry out some orders (for example, draw blood, do an EKG) but the doctor must do certain procedures himself (for example, spinal taps, suturing). As far as what you'd like more, I think I can sum it up in a sentence or two. As compared with being a nurse, being a doctor is more demanding and more stressful, but also more rewarding. Since you've read my book, you know about some of the stresses ER doctors face. A: In the ER, PAs generally can do everything MDs do with the exception of major surgery, but PAs usually see the easier cases (sore throats, ankle sprains, rashes) and the MDs see people with pulmonary edema, intracranial hemorrhage, etc. My ER site is extensive, with over a hundred pages, some of which are longer than a typical book. Therefore, you may not have had the time to read everything I wrote. Had you done that, you would realize that I strongly support the nursing profession. I repeatedly made the point that (especially in the ER), doctors and nurses work as a team, and that all members of that team are vital. Furthermore, I am a strong proponent of what I believe is the only practical solution to dealing with the shortage of qualified nurses. Had you read all of my site, you would have encountered that proposal — which would, by the way, do far more for nurses and the nursing profession than anything I have ever seen advanced by nurses. Therefore, I do not think that it is accurate or fair to characterize my nursing viewpoints as being inimical to that profession. You objected to ". . . being a doctor is more demanding and more stressful, but also more rewarding." First, I think this world would be a better place if everyone felt that their job was the most rewarding one in the world. Second, it is my opinion that it is more demanding and stressful to be a physician than a nurse, especially in the ER. The education, training, and requisite knowledge base for ER physicians is substantially more extensive than that of ER nurses. In most emergency departments, there are several nurses working for every ER doctor. Most of the shifts that I've worked were single-coverage, meaning that I shouldered the responsibility for every patient in the ER (as well as inpatient obstetric and other emergencies during the night shift in some hospitals). Nurses could share the load by taking a subset of these ER patients and, if the pace was too hectic, backup nurses could be summoned from the ICU, CCU, or other medical floor. In my opinion, the greatest demand and stress of being an ER doctor is the realization that every patient I treat (and there could be dozens of them per shift) depends on me to do the myriad things that doctors do: read EKGs and x-rays, interpret tests, perform advanced procedures beyond the scope of nurses, diagnose, prescribe, and to determine a suitable disposition. ER RNs are not trained or legally permitted to do these things, which of course absolves them from the demands and stresses of doing these things countless times per year on thousands of patients. Doctors are the ones who are ultimately responsibility for ensuring that their patients receive optimal care. If a patient is misdiagnosed or given the wrong therapy, it is the fault of the doctor, not the nurse. If there is a serious problem with a patient, an ER nurse can and should notify the ER doctor, who must then determine how to respond. ER nurses are unquestionably essential, but if a potentially life-threatening problem develops, patients count on ER physicians — not ER nurses — to determine the therapeutic response. With rare exceptions, when a patient dies who should have lived, it is the doctor's fault, not the nurse's fault. Thus, doctors are the ones who must shoulder "the buck stops here" responsibility for patient care. As I alluded to before, nurses can and should pass the buck when a serious problem develops. If doctors could similarly pass the buck, their work would be considerably less stressful. Human life is incomparably precious, and the loss of it is incomparably tragic. In a nutshell, that is why I believe it is more demanding and stressful to be a doctor than a nurse, because doctors are the captains of the ship. They're the ones who chart the course of patient care. Their actions literally determine if patients live or die. Until you have worked as a physician, I do not think that you can fully understand what it feels like to be ultimately responsible for a patient's life. It can be a heavy burden, but it can also be highly rewarding when a life is saved. In my opinion, there is a correlation between the difficulty of something and its potential reward. Perhaps I am biased from being a physician instead of a nurse, but I do think that when a patient on the verge of death becomes my patient, it is more rewarding to be the one who determines the cause of the problem and what to do about it, instead of the one who carries out the orders of someone else. When things go well, as they usually do, nurses should take great pride in knowing that they contributed to the outcome. However, I personally cannot fathom how it could be equally rewarding to, for example, administer a drug that someone else ordered than to be the one who determined what drug was needed. I could cite numerous other examples that illustrate my basic point: namely, that occupational reward is commensurate with occupational demands. This correlation is not unique to the healthcare professions; there are many other examples of it. Being President is more demanding but potentially more rewarding than being a civil servant who does not determine policy or shoulder the burden for it. Would anyone contend otherwise? Or who would think that it is not more demanding but potentially more rewarding to be a corporate CEO than to work in its shipping department packing boxes? I am astounded that anyone could dismiss this correlation between difficulty and reward. This association is well-known and not limited to occupational tasks. You also objected to my statement that nurses ". . . do everything the PAs and MDs don't do." Please understand that I receive far more questions every year than I can respond to in a comprehensive way. I sometimes have the time to compose exhaustive answers, but I sometimes must be brief. I never said or implied that every response on my site was necessarily comprehensive. Some of my replies are encyclopedic, while others are the Reader's Digest-type of condensed material. My site is primarily intended for people interested in a career in emergency medicine or another medical specialty. I recommend that anyone with such an aspiration take the time to read my entire site to ensure that they don't miss anything. I cannot — nor would I want to — repeat everything that I previously wrote every time I respond to a question. Readers who wish to obtain a comprehensive understanding of my information must read my entire site; its content cannot be shoehorned into every response. Reading my entire site offers a better understanding of the role of nurses. Is there some overlap between what doctors and nurses do? Of course there is. For example, if the nurses were busy and I was not, and a bed needed making or a urinal needed draining, I'd do it, even though most physicians disparage those tasks as "nurse's work" that they never do. Period. I strongly believe that effective teamwork in the ER requires rethinking of traditional circumscribed roles and tasks. Yet there will always be things that only doctors can do. In the conclusion of your letter, you asked me to contact you to discuss how I can work with your organization to help the ER nursing profession. I welcome this opportunity, and I will reciprocate by giving you space on my site to regularly discuss the profession of emergency nursing. One reader suggested that I refer questions about non-physician personnel to organizations representing those personnel (Update: I tried doing that, but they never responded to the people who asked the questions. Interestingly, even when the head of some nursing organization wrote to me and suggested that I refer questions to her, I did just that, but again received no response. What's the proper term for this? Hot air? It's not that they are willing to answer questions — they just want to silence people whose opinions are not in lock-step with their own. What's the proper term for this? Thought police? Nazis?). First, I don't know of any organization representing ER clerks or ER techs. While there are organizations representing nurses, I am woefully disappointed by their efficacy. In my opinion, they have not done much for nurses. My friends who are nurses have given me an earful of complaints about their occupational gripes. There is no easy remedy for some of these dissatisfactions, but many of them could be solved if nursing organizations were less namby-pamby and possessed a better vision of how to advance the nursing profession. Instead of bold steps that could make nursing careers more satisfying and rewarding, those organizations seem to content themselves with spineless policies that do little to appreciably improve problems that are faced by today's nurses. The predictable result is that these problems persist year after year, thus making nursing a more frustrating career than it should be. I've traced the roots of these problems and concluded that many of the unsolved problems that perennially plague nurses stem from a surprising source: a lack of self-esteem and self-worth amongst nurses and their leaders. If you look past the meaningless "nursing pride" rhetoric, you will see that, deep down, nurses discount their true worth and are too willing to accept the "you're worth only this much" BS that nurses are fed. Collectively, nurses have implicitly acceded to these usually tacit putdowns. Society sees nothing wrong with showering boatloads of money onto people with easier and less important jobs, but when it comes to paying nurses what they are really worth, society speaks volumes about what it thinks of nurses when they receive a pittance for helping to save someone's life but a stripper can make thousands per night displaying her anatomy, or real estate agents can make over $20,000 for selling a house after they've passed their grueling week-long training course. Ahem. Even when nurses are given positive strokes, these are often trivial and even patronizing. One of my nurse friends shows me the stuff her hospital gives to nurses on special occasions. The two most recent trinkets are shown below. Neglecting the fact that this junk food is filled with sugar, artery-clogging partially hydrogenated fats, and other unhealthy ingredients (shouldn't hospitals be role models that promote healthy eating? ), ask yourself this question: Do you think that hospitals give such things to doctors? No, because they are treated as adults. 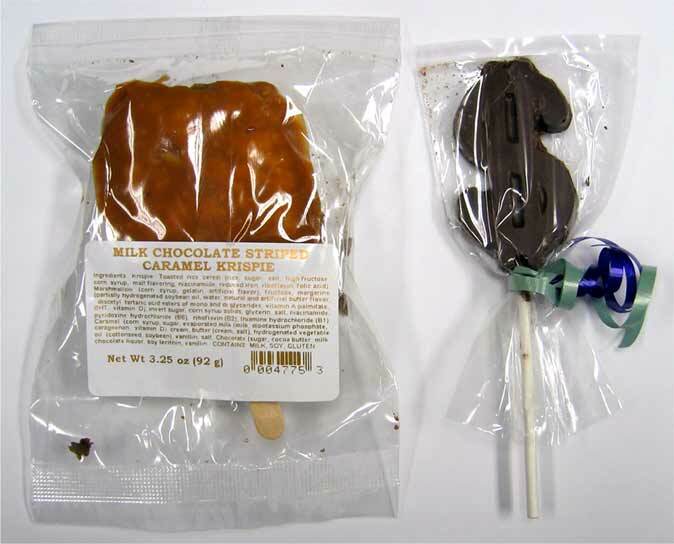 The nurse who received this junk said that her hospital "passes out this candy like we're children." She opines that they're treated as children in more substantive ways, too, such as being required to use time clocks to punch in and out. I've never seen or heard of a doctor being required to use a time clock. Incidentally, she is disgusted with the way that nurses are treated and is planning a web site that will give an insider's view on what it's really like to be a nurse, and how nurses could improve their lot. I'll link to that site once it is operational. Q: I want to be an ER nurse. After I graduate, can I start working in the ER right away? A: I recommend that you get some other nursing experience before working in the ER. The jump from nursing school to the ER is, in my opinion, too great. By analogy, most talented baseball players who are destined to play in the major leagues don't go from high school to Yankee Stadium in a week; most play in the minor leagues to gain experience. I don't mean to imply that CCU, ICU, or floor nursing is the minor leagues, but the pace is generally slower and the atmosphere is more conducive to learning. A: Of course they are, but how many television shows are truly realistic? The docs aren't that handsome, either. Furthermore, many of them can barely speak English! Before you go knocking nurses too much, I should point out (as I have elsewhere on my site) that I've worked with several nurses who were far more beautiful than the TV nurses. Now that I'm on the subject of beauty, I should also mention that many real-life female physicians are stunningly attractive, while the actresses who portray them are comparatively plain. A: Some ER's do employ physician assistants (PA's). I've worked with two of them, one of whom was excellent while the other person was a disaster: not dedicated, not thorough, not knowledgeable, not responsible, and she was seemingly incapable of learning. With so many more qualified PA's to choose from, the only reason I can think of as to why my boss hired her is because she had a cute face. Q: What is the job title of an ER clerk? A: It's just "ER clerk." Q: Can you give me more info? A: The clerk answers the phones, fills out all sorts of forms and requisition slips, helps find things that are inevitably lost (like x-rays), puts lab results (etc.) in charts, and so forth. A: No, I know of no other sites, and I don't have anything more to add. ER clerks do a lot, but their work is far more repetitive than diverse. Hence, there isn't much one can say when describing their job. How did you get stuck writing an assignment on such a narrow topic? A: The requirements for assisting in an ER vary from state to state and hospital to hospital. For example, some hospitals permit EMTs (emergency medical technicians) to work as ER assistants (often called ER techs), while other hospitals do not—they require a nursing degree of some sort. You sound like you're an intelligent young lady. Why don't you become a nurse or a doctor instead of being an assistant? Jennifer's response: Dear Kevin, I would love to become a nurse, but I can not afford nursing school and I am having trouble getting financial aid. I just want to do something in the medical field; it doesn't matter what it is as long as I can help people. Thank you for responding to my email. Please don't let financial considerations discourage you. I received some financial aid, but I paid for most of my education by working four different jobs. My best job was mowing lawns—I earned up to $35 per hour, and kept in great shape, too! If I had to do it all over again I'd probably make money by designing web sites or something similar. I know people who do that and make $50 per hour (plus, the hours are very flexible). I would really appreciate any answers I receive. Thank you. A: I can help you with the answers to parts (a) and (d) of your question. To become an ER nurse requires a minimum of 2 years of college to obtain an RN degree. Some nurses choose a somewhat different program to get a BSN degree, and they also become RNs, but after 4 years of college. Salary ranges widely from one area of the country to another. Some nurses make around $40,000, and others make around $100,000 . . . which makes me wonder why I bothered to spend so many years becoming an ER doctor! Can a nurse practitioner become an ER doctor with continuing education? Q: I am doing a research about nurse practitioners and there is a question that says: what else can they do with their degree and chances for advancements in this field? I want to know if a nurse practitioner can become an emergency room doctor with continuing education. Thank you very much. A: No, a nurse practitioner cannot become an emergency room doctor with continuing education, unless that education includes medical school and residency. In the future, some hospitals may employ nurse practitioners in an ER, but they will never supplant ER physicians who have far more training and skills. Contact your local hospitals to see if they offer any volunteer programs besides the typical candy-striper extremes: young people in high school being used as unpaid laborers, or retirees selling magazines and candy on rolling carts or in the gift shop. I've never heard of any other volunteer programs, but you may discover something interesting. If you personally know a physician, that doc may be willing to let you tag along with him or her. For example, years ago one of my friends with an interest in medicine wanted to come with me to work one day, so I dressed her up in one of my doctor's smocks and introduced her to patients as Dr. Smith so she could witness what I did. The only problem was that at that time I worked at an Urgent Care center, not an ER, so "Dr. Smith" inferred that being a doctor wasn't so bad after all (which it isn't, if you work in an Urgent Care Center). "Dr. Smith" applied and was accepted to medical school, during which time I fielded several calls from her expressing sincere regret that she'd made a wrong career choice. One of the dilemmas faced by all medical students is: what do I specialize in? Like many medical students, "Dr. Smith" was enamored more with the idea of being a doctor in general than she was with the reality of being a particular specialist (and I'm not referring to the generalist/specialist dichotomy, since these days even family practitioners are considered specialists). She sweated through months agonizing over what specialty she should choose. She'd call me up and say, "Kevin, what about Internal Medicine?" I'd then list all of the attributes of Internal Medicine, and then she'd counter with all of its well-known (to medical students and doctors, anyway) drawbacks. This went on and on until we'd exhausted the pool of available specialties. After that, we repeated this elimination round twice more before she decided on Physical Medicine & Rehabilitation (PM&R). The consensus among doctors I know is that PM&R is about as far removed from medicine and being a "real doctor" as is possible. Perhaps that is why my friend chose that specialty: if she couldn't entirely get away from medicine, then get as far away as possible. (1) By the time a doctor becomes disillusioned with medicine, he is likely married and has kids to support. So, like other working stiffs, he keeps on working. (2) He doesn't possess the skills that would allow him to make a comparable income from another job, so he puts up with medicine. (3) He fails to realize that the business tenet of "sunk costs" is very applicable to many things in life, especially career choice. (4) He has dozens of student loans to pay off. -- My mother had an awkward time discussing my occupation when she was asked, as mothers always are, what their children do for a living. "Um, Kevin is a doctor . . . but he's not practicing right now. He's writing books, inventing, doing research, and he's the editor of a snowmobiling magazine." One thing I've learned is that authors, inventors, researchers, and magazine editors (especially of snowmobiling magazines!) aren't looked upon very kindly by the general public. Whenever my Mom mentioned those occupations, the listener would often wrinkle her nose and question why a doctor would quit medicine. The general public, you see, still harbors the notion that being a doctor is a great job, and anyone who voluntarily left it is a fool. -- I, too, had an awkward time discussing my new occupations. When asked what I did for a living, people would almost always say something positive when I answered that I was a doctor. In contrast, I'd often be greeted by quizzical looks if I mentioned those other occupations, especially if I also mentioned my prior career. -- On to the painful reality. Your family members will always love you regardless of the status of your occupation and your income. That's not so for just about everyone else you'll meet. Let's discuss one of the ancillary perks of being a doctor, and how it evaporates once a doctor leaves that profession. What is this "ancillary perk" to which I am referring? Ever notice how doctors often have beautiful girlfriends and wives? One woman I used to date once described me as "not handsome but good-looking." I'm not certain what she meant by that convoluted statement, but—like most guys with average looks—I've learned that beautiful women didn't swoon over me because of my appearance. However, once I became a doctor I was utterly amazed by the fact that stunningly beautiful women would date me. However, during my hiatus from medicine my "dating desirability" plummeted. This fact is hardly a secret, and it is one of the reasons people go into medicine: to get a more desirable spouse than they could otherwise obtain. Virtually no one will admit to this, but it's true.